It was one of the few sunny spring days when Luis Echevarria and I wandered down the grassy path towards the poultry enclosure at the 40-acre La Caridad Farm in Parksley. As we approached, I noticed a large white goose honking furiously at us. 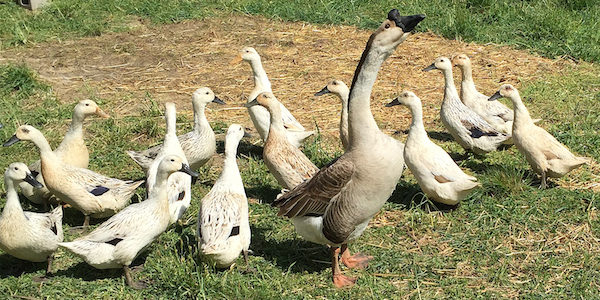 This is a goose with the job of guarding the ducks — and he works for food. Luis explained that several days before, this goose bit his wife Stacia Childers’ leg, causing a large and painful bruise. Since introducing the goose to the flock they have not lost any to predation. The well-guarded ducks are Welsh Harlequins, which weigh about 5 pounds and lay an egg almost every day. Their eggs are larger than chicken eggs, but Luis prizes them mostly for their richness. When Stacia joined us she kept her distance from the goose. The chickens are in an adjoining enclosure and are of varied breeds. 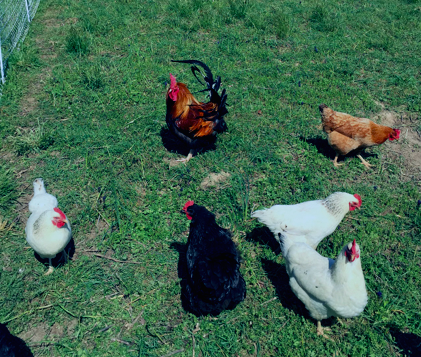 The rooster shown at right is a Dorking, the white hens are Delawares, the brown hen is a New Hampshire and the black hen is an Australorp. They also have Easter Egg layers or Ameraucanas, which produce green, olive, blue or pastel colored eggs. Luis and Stacia gave me a dozen eggs to take home with me and I ran a test a few days later. I borrowed an egg which had come from regular Food Lion eggs. I photographed the La Caridad and Food Lion egg side by side. Can you guess which one came from La Caridad? The answer is at the bottom of the article. We ambled toward the west side of their farm where they had set up a pen inside a wire enclosure under some trees for their three heritage breed Mulefoot pigs. They refused to come out for photos and obviously preferred snuggling and wallowing in the muddy comfort of their shelter. Later we also visited the brooder house where they are raising Freedom Ranger chicks for meat. Even though relatively fast growing, these birds are not anything like the traditional Cornish Cross bird raised by the industrial poultry industry. It takes them 10 to 16 weeks to reach the appropriate weight and size of a small roaster bird. 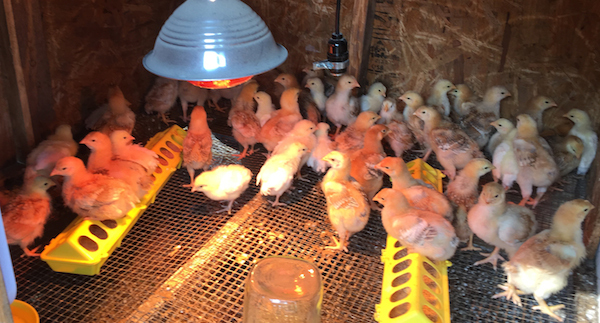 After 30 days in the brooder house they will be put out to fresh pasture every day by means of a movable pen. By foraging for some of their food, they ingest insects, seeds, and grasses that greatly increase the nutrient density of their meat. These birds will bring in much needed income that will be reinvested into the farm to continue developing its infrastructure. Luis and Stacia are getting ready to plant a vegetable garden, mostly for their own consumption, which will have at a minimum Irish Cobbler potatoes, okra, tomatoes, and possibly strawberries. They set up a small trial plot where they planted three or four varieties to see which type of plant will produce the most flavorful fruits. They also have wild raspberry plants (also known as Wine Berries) and last year the owner of Brown Dog Ice Cream, Miriam Elton, bought 10 pounds for her incredible ice cream. There’s a lot happening on this farm especially considering that they’ve owned it for only two years — and both Luis and Stacia have full time jobs. They come from modest backgrounds, and everything they have they’ve earned through ingenuity and hard work. They were fortunate to have had some assistance from the USDA Beginning Farmer Loan Program even though they’ve chosen a non-traditional path for the Eastern Shore, eschewing the monoculture of soybeans, wheat, cotton, and corn which in 2012 brought in over $4.8 million (from the Environmental Working Group Farm Subsidy Database) in USDA subsidies for larger farms in Accomack County. Qualifying for this program required more hard work in that they needed farming experience and a very solid business plan. Fortunately, Luis grew up on a farm and has a degree in Animal Science. Although he spent one year at Perdue Farms in a breeding facility, he currently works for the Virginia Employment Commission as a Farm Placement Specialist. Stacia provides support by working at the Eastern Shore Public Library. Each year they’ve been able to make hard-won improvements. 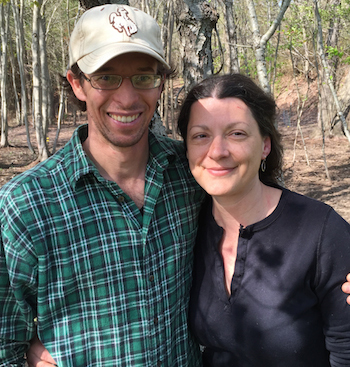 They’re hoping in the next five years that they’ll have built a small farm store, a highway sign, and completed a barn they need for their animals. In addition, they’d like to acquire a small herd of dairy goats for milk for themselves and the pigs. Eventually, Luis would like to be a full-time farmer, but they need to develop their business to accomplish this. Their farm, La Caridad, is named after Luis’ grandmother, and means “charity” in English. It is an apt name because it is clear that they have great affection for their animals and work hard to provide a rich, species-appropriate environment for them including non-genetically modified feed. Earlier this year they were thinking of getting several dairy goats. Ultimately, they decided not to do it because they did not believe they had the correct infrastructure to provide comfort to the goats. It is this sort of decision that sets these farmers apart from those who raise chickens and other animals in overcrowded conditions in preparation for long grueling trips to the confined animal feeding operation or butcher. It’s true that many of the animals on their farm will end up on someone’s table, but until that time, they are in a comfortable and safe environment where they live as nature intended them to live. EGG YOLK ANSWER: The yolk on the left is from La Caridad Farm. 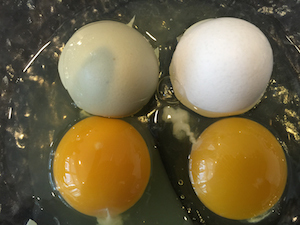 It has a deeper orange color which indicates it has more Vitamin A and D than the egg on the right. Where do they sell their eggs and chickens? To include directions, products, store, history, etc. Janet, we sell from the farm in Parksley for now. We hope to frequent some of the farmer’s markets later, maybe in a year or two.